I've never participated in a focus group so I don't know if being part of such a group would be fun. Obviously the ensemble known as The Mad Ones thought that a play about such a group would be fun, meaningful and a good fit for their style of ensemble-devised plays. The purpose of the fictious focus group's session that moderator Dale (Mad Ones member Brad Heberlee) wants to make "a bit of fun" is to help the producers of their long running kiddy TV show called Mrs. Murray's Menagerie a bang-up final season. I didn't see Miles for Mary during its run at Playwrights Horizon and while Paulanne Simmons didn't think it was perfect, she did find it very funny. (the review). 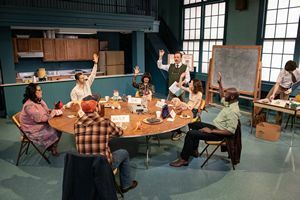 Thus, Ars Nova's first play in its new home on Barrow Street seemed like a great opportunity to see this ensemble once again put just plain folks into an unglamorous setting to discuss a less than world shaking upcoming event. Judging from the press materials, this world premiere apparently has quite a lot in common with Miles For Mary. Instead of unfolding in /a high school office, Mrs. Murray's Menagerie is set in the rec room of a Philadelphis Community Center. Instead of teachers, we have a group of moms and dads who know enough about that TV show to provide plenty of input about their own and their kids' opinions about content and characters help give that kiddy hit a bang-up final season.
. What's more, the play is set in another another era— in this case, the late 70s— and it features most of the Miles for Mary onstage and backstage team. I wish I could tell you that The Mad Ones have struck gold again and managed to turn an essentially humdrum situation into a hilarious romp. Judging from the enthusiastic applause at play's end, you may be among those for whom there's a really smart, subtle comedy here. But somehow it eluded me. About half an hour in, I felt that I was simply watching six people sitting around and talking, but not coming up with anything all that revelatory or meaningful about the show, themselves and the era during which they and their kids got to know the show's human and puppet characters. Nor did the discussion deliver more than very occasionally on that "tiny bit of fun" promised by Mr. Heberlee's Dale that I quoted at the top of this review. To my surprise and disappointment, even Lila Neugebauer is not at her best here. Besides her work with The Mad Ones the busy Neugebauer has always impressed me with her subtle, on the mark direction. Yet, she's been unable to overcome the static set-up of a cast that the plot (if you can call it that) has sitting around the table at the center of Laura Jellinek and You-Shin Chen;s set. Except for occasionally getting up for a cup of coffee, the six groupies —Phillip James Brannon (Ernest), Joe Curnutte (Roger), Michael Dalto (Wayne), Carmen M. Herlihy (June), January LaVoy (Celeste), Stephanie Wright Thompson (Gloria) — are pretty much locked in place. And little has been done to address the theater's semi-thrust seating arrangement. Neugebauer does keep moderator Dale moving around. Also more on the move is Dale's silent assistant Jim (Marc Bovino) who's tasked with summarizing each roundelay's comments on a big blackboard. However, since Jim ends up erasing everything, this ends up feeling like something of a gimmick to milk his scribblings for laughs that are not provided by the table talk. It was also unclear to me whether Marc Bovino actually had an accident that put his arm in a cast, or whether this too is an attempt to ratchet up the laughs. As the focus session continued on its rather repetitive path, my own puzzlement as to where this was all going escalated. Somehow, I found myself conjuring up visions of the people who run the Show-Score site (www.show-score.com) deciding to have a meeting with small groups of their non-critic members. The idea in this case would probably be to discuss the scripted phrases Show-SCcre staff apparently cooks up to help these amateur critics rank and write about shows before they're officially open for reviews by "real" critics. (That might indeed be a bit of fun!). Actually Mrs. Murray's Menagerie does finally go somewhere. But that somewhere is a very brief visual stratagem. The only thing I'll say about this is "keep your eye on Philip James Brannon's Ernest. Of course any theatrical enterprise dedicated to nurturing experimental work is entitled to a few missteps. I have no doubt that the Ars Nova and Mad Ones fans who packed the house on the night I attended will see more hits than misses in the future — both from Ars Nova at its new home and The Mad Ones during their upcoming residence at the Pershing Square Signature Center. Cast (Alphabetical: Marc Bovino (Jim),Phillip James Brannon (Ernest), Joe Curnutte (Roger), Michael Dalto (Wayne), Brad Heberlee (Dale), Carmen M. Herlihy (June), January LaVoy (Celeste), Stephanie Wright Thompson (Gloria). From 3/26/19; opening 4/08/19; closing 5/11/19.